Have you ever wondered how to silence your paintball gun? maybe a Spyder or Tippmann, well I wanted a cool sniper gun, and figured a pump Traccer was just the marker to do it with. I started with a 25 micron water sediment cartridge I bought at Sears. I think it was a little overpriced at about $12 but whatever. Essentially it's a foam wound tube that goes into a whole home water system. Next a trip to Home Depot. I bought a 12' piece of CPVC ¾" inch tube from the plumbing section $10 I cut it up into 3 pieces to get it home. You will also need to pick up 2 of the ¾" connectors in the same section. The connectors inside diameter are already the size of the stock Trracer barrel 1" outside, and the ¾" inch tube is big enough to let the paintball slide through. The outside diameter of the connector is the same size to as the inside of the water cartridge, making a really nice tight fit. 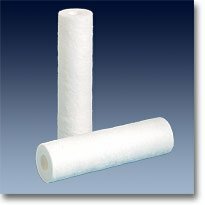 So next cut the tube to the length of the water filter. The connectors are going to go into each end of the water filter to keep it straight and solid inside. Then I bought two types of Camo tape from WALMART hunting section. 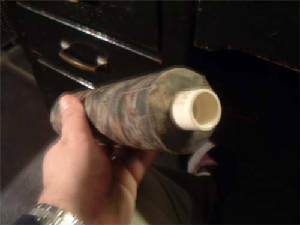 One was the removable tape, $6, the other was Camo duct tape (way bigger roll for $8. I started with the Duct tape wrapping the front, then the outside of the tube, make sure to overlap to not leave any gaps. We want it to be basically air tight. The other end of the tube gets the removable tape, which allows air through. 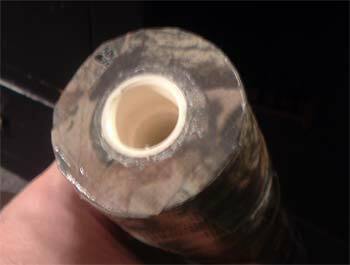 Once done the tube will be fully covered in camo tape, The front will be covered in Duct tape, the back in the non shiny removable tape. I used the two different kinds of tape, because we don't want to build a silencer that's just huge, so we need somewhere for the extra gas to go, so it doesn't pop a hole in the tape. The back removable tape lets the gas and noise out, but back towards you, not towards your victim. Next use a dremel to cut holes and slots in the tube, and smooth the inside front and back of the tube, if you look into the tube with the connectors in you can see the lip of the tube, smooth that away. I added the foam around the tube so the gas doesn't blow around the ball and come out in front of the paintball. So now smooth the outside and inside. For the inside I used a wood dowel with very fine sand paper taped on the end for the inside of the tube, it seemed to work ok. Once all the little pieces were gone, I hot glued the foam strips on and the BACK connector together. The front connector I glued to the inside of the water cartridge, so it's still possible to take it apart if really needed. 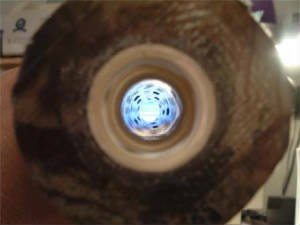 A look from the front down the barrel, notice the holes in the tube. Here it is with the silencer on. There is a noticeable change in the noise, even dry firing, the high crack of the shot is now gone, the low pop is still there. 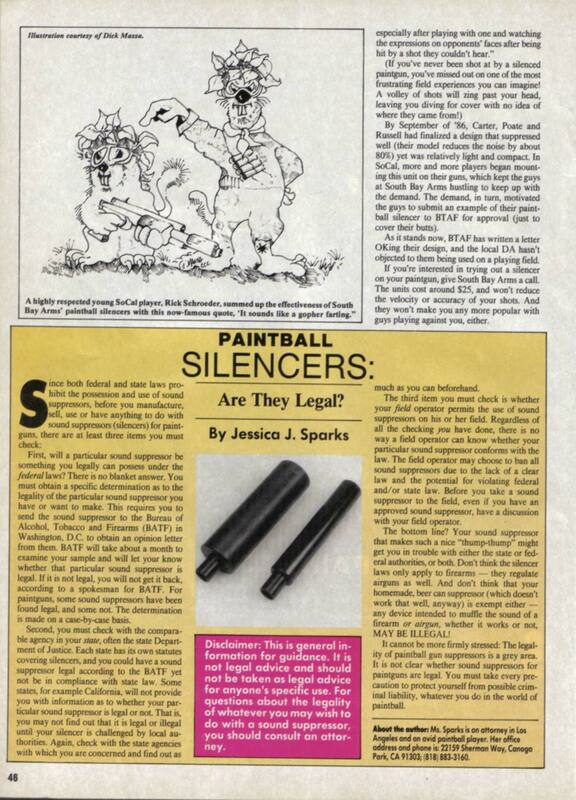 With a paintball it's even quieter! Foam and glue, I had already. Total $37.50 but, I do have tons of Camo Duct tape, and CPVC tubing left. Easily enough for 4 more silencers. The removable stuff would do for 4 more as well. So if 5 people together and made them it would be just $18.60 each. Now a word of warning. I am not in the US, according to the ATF this is illegal, even though it is for your paintball gun, not a real gun. Here in Canada we don't have the ATF, the individual city or provincial cop would have to charge you, after making a person, professional judgment if he thought that it was worth laying a charge. In the states that's all the ATF does, tracks down firearm offenses and kicks in the door. You DON'T want it to be your door. So I'm taking the risk. Maybe you shouldn't, it's your call. 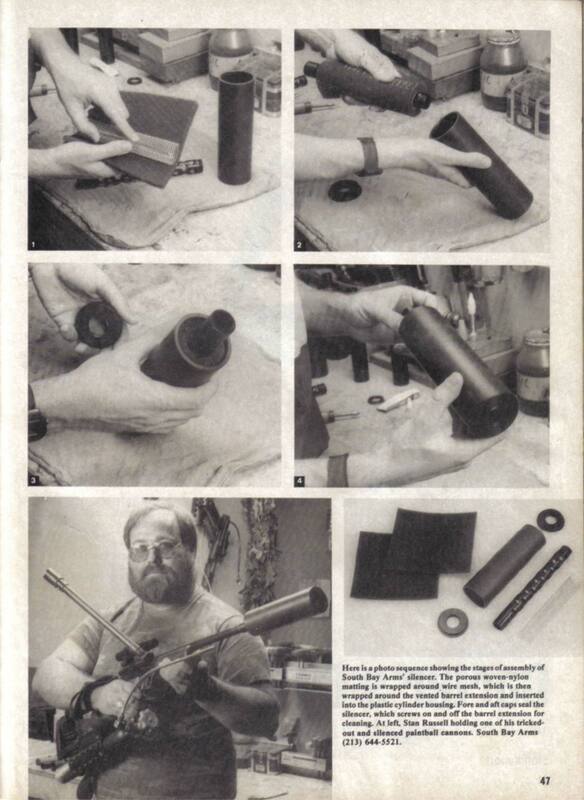 People looking for info on building a real gun silencer. Sorry but this won't work at all. The theory for slow moving gas and high speed firearm gas is really different. On a real gun this design will just make a large POP as it breaks into a bazillion pieces. There are a lot of people that say that there is no such thing as a paintball sniper. That's because the ATF cracked down and stopped players from using silencers, sometime around the late 1990s. Before that there most certainly were snipers in paintball. Any time you get shot and can't see who shot you, maybe you too will believe. 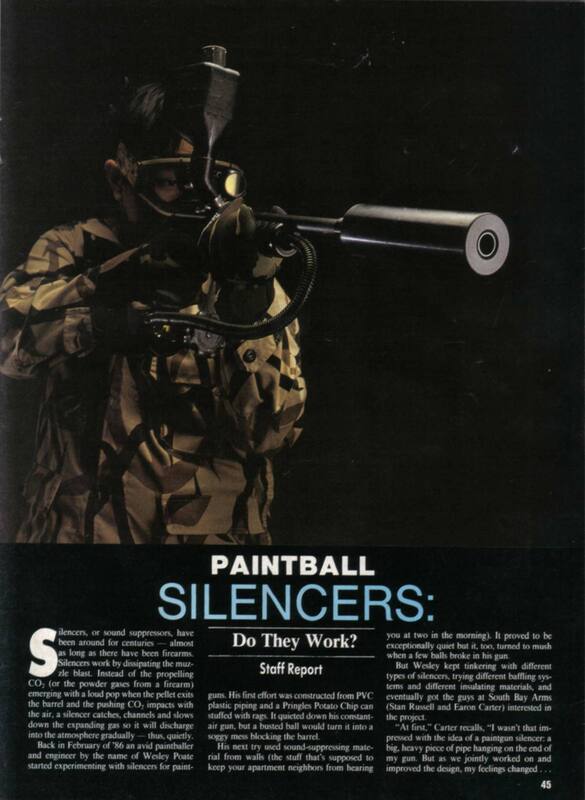 A paintball gun silencer, sometimes called a suppressor, allows a sniper to be super quiet and muffle the shot as he hides from his opponents and sneaks behind enemy lines. With this device you too will become a ghost sniper. Well I was dug into a little hollow in the grass. We were playing zombie. So I could only kill the evil zombie hord with a head shot. Well I saw the zombie come around closer and closer. 15ft perfect shot, and I had a misfire, ball just fell out of the barrel. Zombie didn't even hear the gun at 15ft, didn't turn or do anything. I had all the time I wanted to pump and aim again. Direct hit. NOW THAT's A WORKING SILENCER!!!! If you can't read the text just right click and view image to see it full size.